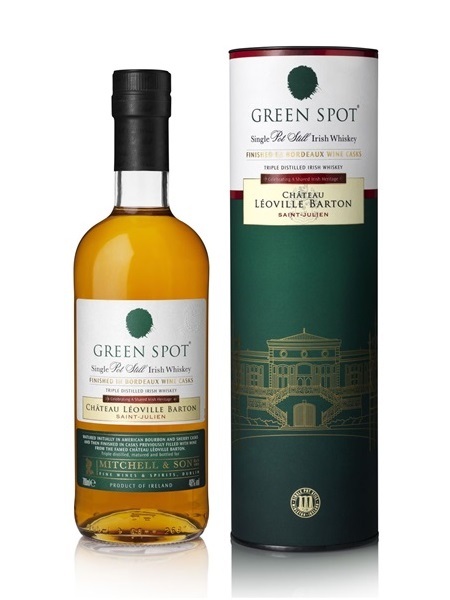 Green Spot Château Léoville Barton (~€70) is a Single Pot Still Irish Whiskey, initially matured in ex-bourbon and sherry casks and finished in French bordeaux wine casks for 12-24 months. Green Spot was originally produced exclusively for the Mitchell family who commenced trading in Dublin in 1805 as purveyors of confectionary, wines and fortified wines. In 1887, this entrepreneurial family expanded into the whiskey bonding business whereby they sent empty wine, sherry and port casks via horse and cart to the local Jameson Distillery which were then filled and returned to the Mitchell's cellar warehouse. There the whiskeys matured for many years under bond until they were ready to be bottled and sold. Green Spot has no age statement, but contains 7 to 10 year old single pot still whiskeys. This spicy, oily whiskey has grown in popularity, despite small quantities being bottled each year. The name derives from the old practice of marking barrels with a colour which represented a particular age. The second half of the story orginates with a Fermanagh man named Thomas Barton, who migrated to the Saint Julien appellation in Bordeaux, France in the 1700s. Today, his vines are tended to by his decendent, Anthony Barton, at Château Léoville Barton, where the French oak casks were selected to finish this flavoursome whiskey. Green Spot Château Léoville Barton is bottled at 46% ABV.